I was just browsing through some of my fav fanpages such as Coca Cola and Pepsi. It amazes that such big brands still can’t quite keep up with their social media moderation. I understand the importance in allowing fans to post to your page for the interaction, but this needs to be closely monitored especially if you’re a small business. 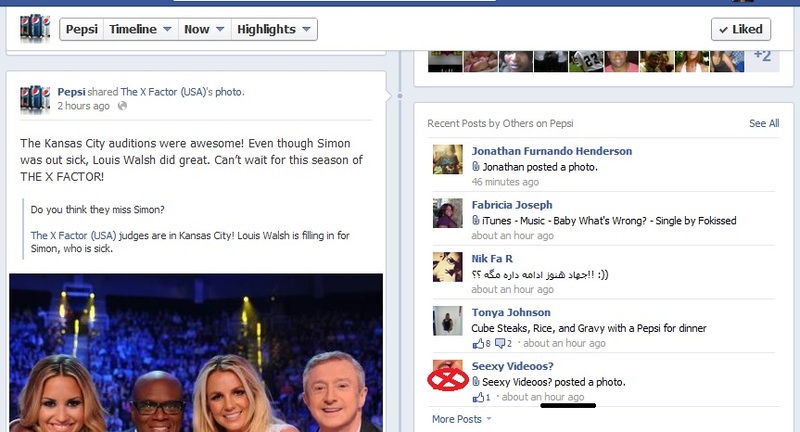 For example the screenshot below shows the activity log of recent posts to Pepsi’s FB wall. Obviously the “seexy videoos” is just horrible spam, but the thumbnail picture is absolutely offensive and pornographic, “hence” the red X . The simple fact that kids will see this as soon as they come to their favorite drink’s fan page is sickening. Bigger brand with a million + fans yeah not that detrimental to business, but if you’re a smaller company and have outsourced your social media management you still can’t let treat it like it’s on cruise control because you’re entire social efforts could crumble apart with an incident like this. I’ve seen many mistakes made by agencies and careless “accidental” postings or unmonitored networks subjected to obscene spam. Don’t fall victim to it. When outsourcing your social media efforts you have to have someone accountable within in your organization, your “champion.” be sure your agency gets you familiar with setting alerts or simply helping you find the right mobile apps to keep you in the know when you’re on the go. You may not be able to stop the spam 100%, but you can be prepared if it happens and be able to put the fire out when need be! So just remember this is your reputation as a business owner staying social is a business by itself and you don’t have to take the reigns, just make sure you know what the horse doing, lol. 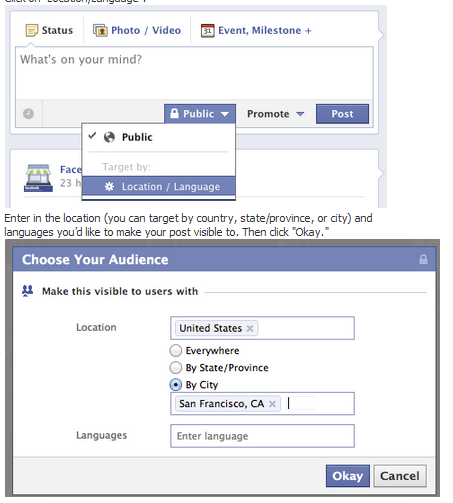 Promoted Facebook Status How Will You Use It? I love Facebook and the surprises they bring. I was browsing my pages this morning and I came across a brand new button that seemed to magically appear because it surely wasn’t there yesterday, unless I missed it. 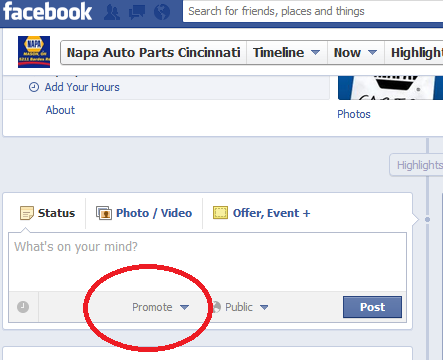 This awesome button allows you to make your status update into a sponsored post for anyone who likes your page. With so much activity going on peoples newsfeeds especially if they like several pages and have lots of friends chances of them seeing your posts throughout the day are slim due to not being able to display all that activity. Why is this feature great? Fact: Only 16% of Facebook users see the updates you post on your business page. The rest of the time you’ve got to hope and pray to the FB Gods that your posts are getting seen, or really track what times of day you’re getting the best reach. Now with a click of a button you can promote a status update just keep in mind that budget you set is a lifetime budget not a daily budget. You also can target by location just like a sponsored story or ad. Which is really convenient especially if your National and only want to run a regional post. Unlike Facebook ads which primarily is used to gain and attract new people, promoted posts will really give brands the opportunity to engage with their fans, and because of this I really hope they use this carefully. 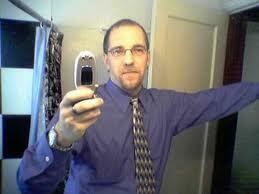 I use my Facebook for personal use like anyone outside of the digital marketing industry. And seeing things froma user perspective I really don’t want to see annoying sponsored links about some sale. Or if you’re a big retailer please do not sponsor the same sales that you send to my email Everyday~ remain nameless. I haven’t tried this out yet, but looking forward to experimenting soon. How are you going to use promoted posts? If you haven’t figured it out by now social media is definitely not a fad, and the majority of users are not you’re 10 year olds no matter how much you try to downplay it. Truth of the matter is that your target market, your perfect consumer who you would loved wrapped around your product is living it in everyday. You may not be a major brand like Oreo, of Victoria Secret, but you sure could act like one. Sure you may not have the the control tower of digital genies that these companies have, but it really isn’t that difficult to adopt some of there techniques down to a smaller level. 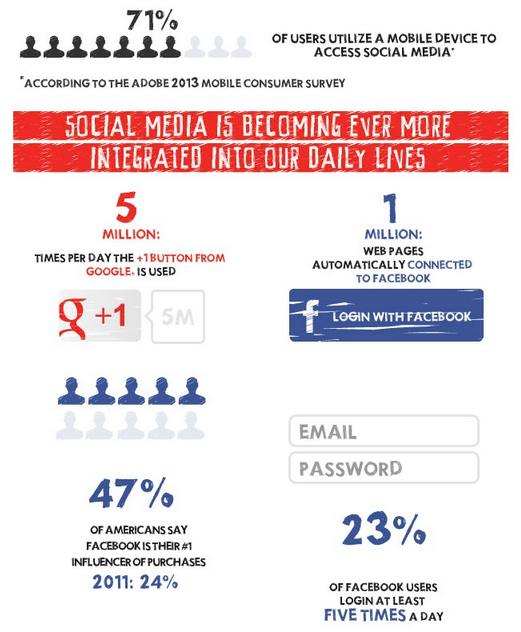 So why put your business and brand in social networks? Because that’s where your customers are! Don’t worry I know you’ve read all the blogs about the value and what it can do, blah blah blah… Really the down to it action plan is really quite simple and any small business can put to work without having foot the bill for an agency. To be honest if you do not have a point person in house you should not even think about outsourcing your social media management. Create and fill in your page THOROUGHLY, yes don’t leave any blanks. Make great use of the product page, I love this feature you can put pictures and descriptions on what you have to offer. Add videos- I would suggest video testimonials if you’re B2c and a “why by for B2B. 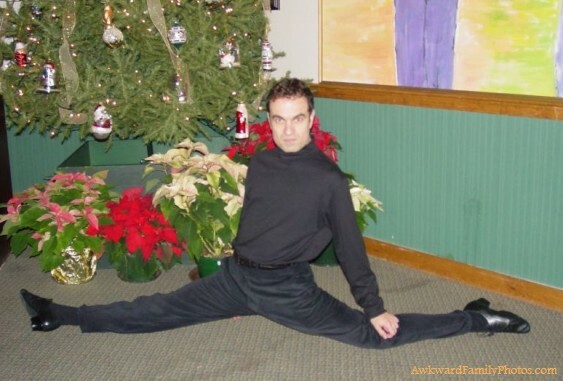 Lastly, and maybe the most difficult get all of your employees to link correctly to your company page. Some may have create a linkedin page and just forgot about it and may have entered the business name different from what your official business name is. It may just take some time showing people how to edit. But it’s simply click edit profile> current position>change company name. Once they start typing in the business name it should auto populate and voala you have employees linked to your company page. Even if you decide not to do anything with your Linkedin Page doesn’t mean other people won’t consumers today expect companies to have a social presence everywhere. And with Linkedin being a professional social network one should have a business page. 2. Decide on the social network that you would like to start with. For argument sake let’s already assume you’ve created a Facebook page. But like many small businesses maybe you’ve posted once or twice a month to a fan club of 101. Don’t worry like I said this was simple. 3. Create a moderation policy and a social media policy if you don’t already have this. The moderation policy is something that would go on your Facebook page (i suggest to put it at the bottom of your welcome page) these are basically the rules for your fans to post on your company page. If someone breaks a rule you can refer them to your policy. 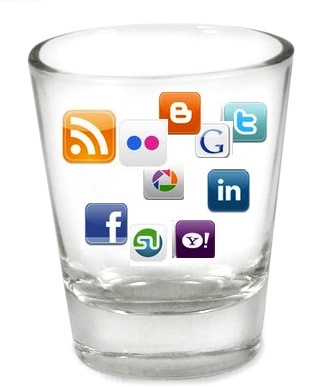 The social media policy is for internal use within your business. It’s just a guideline of your expectations on how employees are using social media in house, and the use of your company name etc..
4. Find your Social Champions! By this I mean, find the people within each of your departments who have passion in what they do and can raddle off the top of there head everything exciting happening that week. Get at least a weeks worth of topics from all of your departments. If they have a hard time of thinking of things ask them to find blogs that specifically pertain to there expertise. Now you pretty much have a social calendar of postings that can last a full month. Depending on your level of trust and relationship with your employees you make the call on whether or to give admin access directly to them for more spontaneous posts or not. Typically just have your point person load up your post schedules using hootsuite, or any other third party ware and you’re good to go. So now that lonely person that was originally sent out to do this task of (community manager) now has a solid calendar of social content, but now can also sprinkly in breaking news, or occasional blogs. 5. Now that you have a wall that shows consistent posts being updated and people interacting with the page (rule get your employees engaged with your page!) The quickest way to build up your fanbase is to get your customer base. 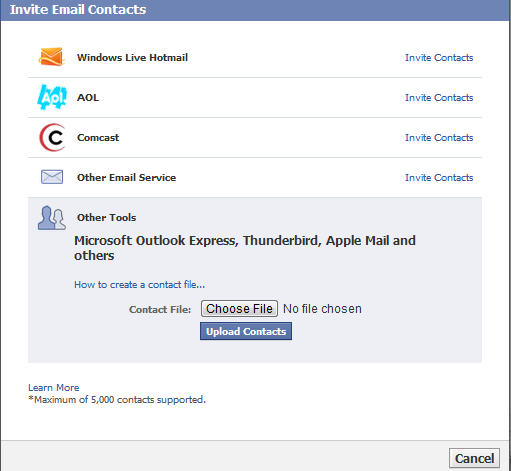 If you have a crm simply export your contact to a csv file and use Facebooks “invite email contacts” option. Don’t forget to and invite to your friends to Like your page and get your employees to do this as well. 4. Don’t get overwhelmed! Once you’ve got a great simple that works great for your business don’t try to move too quickly in wanting to create landing pages, and dissecting your analytics too fast. It’s really easy to get info overloaded with the over saturation of social content-which is a necessary evil because it keeps freaking changing and a new network pops up every minute! 5. Invest in your education. Take the time to listen in on webinars and maybe attend a conference every 6 months. It may be hard to imagine but there are people just like you going through the same shift and it’s always nice to connect with similar and more advanced companies that can show you the ropes. A medium like Twitter allows for unobtrusive frequency to be easy. So here are is a quick know how on why use it and how you can. Twitter is also a numbers game. The larger you build your presence (presence being thought of as a phone book, in this sense) the more you can leverage the nature of serendipity. Not every follower will end up as a true relationship, but if conversion of those relationships is a small percentage, than a larger presence will also equal a larger percentage. From a small business lens, I believe presence building is absolutely essential. Why? As a small business owner, you have limited dollars and even more limits on your time. In that sense, building strong relationships through more frequent communication provides a competitive advantage in terms of finding opportunities (leveraging serendipity) and customer retention (building stronger lasting relationships). Essentially, marketing creates leverage. In the traditional sense, marketing messages helped to position the product or service in the mind of the end consumer so that when the consumer finally hits the point of sale, whether it’s a check out counter, shopping cart or B2B account executive, they already want to buy you you sell. But now things are much different. Communication tools have changed in such a way that we humans have an entire arsenal that allows individuals the ability to create the leverage that you once needed a department of people to accomplish. Human marketers are artists at creating theater of the mind. This is the idea of using technology to create the illusion of being everywhere at once, and all the time. This type of visibility driven largely by using Twitter has helped to create a new breed of celebrities and heroes, fueled by both intellect and inherit charisma. Visibility is also the sister of accessibility, which is very different from the celebrities of older media such as television and radio. Celebrities in those mediums are primarily exclusive and work hard to stay away from the commoners by using money and status as the barrier. Yet, humans are delighted when someone they admire is accessible to them. Twitter, as a communication tool, provides that type of accessibility but also the convenience to make communication manageable. For instance, think about how many tweets your favorite blogger or author must get each day. I’m willing to bet that if you tweet them right now, they will probably respond, even if it’s only a few words and an emoticon. When these popular and busy folks do respond, how does that make you feel? As mobile devices improve over time, so will our ability to master this type of communication illusion.